Everyone’s very sad, or in space, or sometimes both. 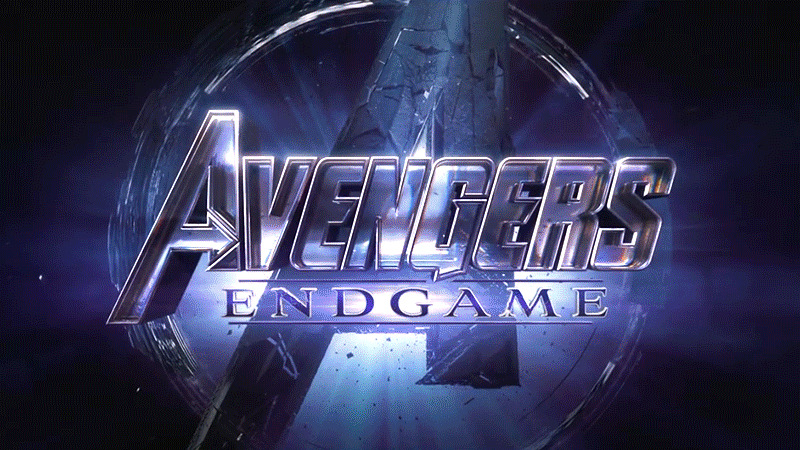 Another day, another surprise Avengers: Endgame trailer from Marvel. It’s almost like a movie’s out this month or something! While there might not be as many major revelations in this new footage, it does help contextualize a lot of what we’ve seen before. Buckle up. I hope you like a lot of shots of sad people. Once again, we open on Avengers HQ, and everyone’s very morose—but plans are underway to take the fight to Thanos “If we do this, we’d be going in shorthanded,” Bruce Banner (Mark Ruffalo) argues. “Yeah, you mean ’cause he killed all our friends?” Rhodey (Don Cheadle) counters. Meanwhile, Thor (Chris Hemsworth) mopes. Expect to see a lot of that description here. Natasha (Scarlett Johansson) takes the mope game up another notch by doing so in the rain, for extra sad points. As seemingly part of the same conversation Bruce and Rhodey are having, she adds “We owe this to everyone not in this room to try.” Note that here she has her two-tone red-and-blonde look, so this shot at least takes place after she’s brought Hawkeye (Jeremy Renner) back into the fold while he’s swanning around Tokyo as Ronin. Weirdly, Nat’s hair is the most useful thing we’ve had as a metric of time in all of these trailers, as she transitions from her blonde Infinity War look into something a little more Black-Widow-y, so it gives us at least a vague idea of just what order Avengers start showing back up at HQ. She’s still full-blonde when both Carol (Brie Larson) and Scott (Paul Rudd) show up, mostly blonde in Tokyo, and then has longer, two-tone hair by the time Rocket (Bradley Cooper), Nebula (Karen Gillan), and Tony (Robert Downey Jr.) are at HQ. 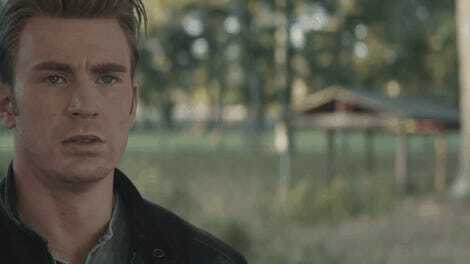 Meanwhile, back to moping—this time it’s Captain America (Chris Evans) doing the work, as he sadly gazes into a bathroom mirror. This is, presumably, in the aftermath of what is truly the greatest loss of all of Avengers: Infinity War, the fatality too great to bear: the shaving of Cap’s beard. Please take a moment to compose yourself, this is a trying time for us all. The last remaining Guardians of the Galaxy share a mope, as Nebula and Rocket reunite. You’ll believe a bald blue cyborg and a CG raccoon will make you well up! The nighttime setting of this shot seems to match up with the previous shot we saw in the Super Bowl footage of Nat, Steve, Bruce, and Rhodey looking up at the stars—and Nat did have her full blonde hair there too. So maybe Team Tony shows up before she goes to fetch Clint? 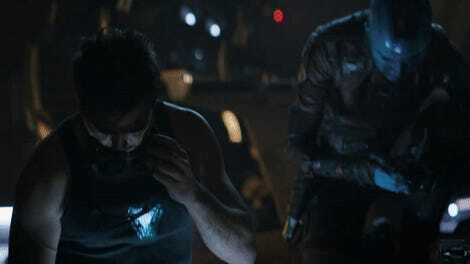 Speaking of Mister Stark, he narrates this shot as we also get to see him embrace Pepper Potts (Gwyneth Paltrow). “It’s not about how much we lost,” Tony tells us. “It’s about how much we have left.” So now that we know that Nebula and Tony get back to Earth in the Benatar, it doesn’t tell us how, given that prior footage has shown the ship seemingly stranded in space with air, food, and water about to run out. We know at least Nebula seemingly doesn’t abandon Tony as earlier cuts of that footage had at least suggested, too. Meanwhile, smash cut to this shot of a brand new set of Iron Man armor for Tony, as he flies above the skies of Manhattan. Hot Toys’ newly-revealed figure of this armor reveals its designation as the MK LXXXV, or Mk. 85—a pretty big leap from the Mk. 50 he wore in Infinity War. It’s very clearly inspired by the color scheme of Tony’s earliest suits in the comics, with much more gold compared to the red-heavy armors he’s worn of late, most notably the Model 2 and Model 3 iterations of Tony’s classic Silver Age looks. These daylight scenes are unlike anything we’ve seen in the rest of Endgame’s trailer footage, so it’s hard to tell when and where this all takes place (although Tony is wearing this armor later on in this trailer, when he confronts Thanos). Given the persistent rumors of time travel taking our heroes back to Avengers’ Battle of New York, there’s always a possibility this is yet another allusion to that, but note the distinct lack of Chitauri-caused mayhem in the sky and on the ground behind Tony, so there’s perhaps a chance he’s just giving this new armor a spin (or it’s yet another fakeout). “We’re the Avengers, we gotta finish this” Tony continues, as Nat and Clint share a smile. Look, people being somewhat happy in this footage! That’s a rarity. Please note that Hawkeye got a sleeve tattoo of a skeleton samurai during his time as Ronin, so god, probably losing his entire family to the Thanos snap sent him full weeb. An extended shot of the last trailer’s standout moment between Captain Marvel and Thor, as the latter summons Stormbreaker in an attempt to jostle the former. Gotta love that Carol smirk. And, at last, everything this footage has been building up to: Our Avengers, assembled. What’s left of them, at least. Or most of what’s left—note that Carol’s not in this shot, and neither is Bruce or Thor. Are they who our Avengers are presumably assembling towards? The handshake heard round the world, as Tony and Steve patch up their Civil War beef for good—and Steve places his trust in Tony once again. Isn’t it nice that the loss of half of all sentient life in existence can bring some distant friends back together? Jokes aside, this clearly takes place in a similar scene to Tony taking flight in the Mk. 85 earlier—and if the lack of Chitauri there wasn’t enough to convince you this isn’t quite so much of a hint to those timey-wimey set pictures, note that Steve is in his Age of Ultron/Civil War/Infinity War uniform, which is pretty beaten up at this point. The Benatar takes flight once more, and things get very interesting. First, note the team here—Carol, Rocket, Rhodey, Nat, Steve, and Thor. Second, note the costumes. Nat’s back in her blonde Infinity War look, and Steve is wearing his Winter Soldier stealth suit. This tells us that the conversation they both have where Steve looks at his compass containing a picture of Peggy Carter (Hayley Atwell) from the initial Endgame trailer takes place during this flight, but it also throws up all sorts of intriguing questions about when this happening, and what this team is up to. If this is before Nat brings Hawkeye back from Tokyo, but after Tony and Nebula return to Earth, there’s a whole extraterrestrial sortie happening here we have no idea about. It also intriguingly re-contextualizes that shot we just got of Tony and Steve shaking hands, given Steve’s in his worn-out gear there and in fresh gear here. But why would Tony—not Nebula, as we later see her in what used to be Star-Lord’s seat—be staying behind? Who can say? Enjoy Captain Marvel captaining a ship, nonetheless. ...As Thor and Rocket look horrified at something. Note the designs in the background—this is either one of the ring ships or the Sanctuary II’s interior itself, so presumably the team leads an attack aboard Thanos’ ship, either to find him or some way of stopping him aboard it. What could they find aboard that shocks these two so much though? ...Tony, on the same battlefield. This battlefield played a major role in the most recent trailer for Endgame, and between that trailer and this shot we’ve now seen Ant-Man, Nebula, Cap, Iron Man, and Thor (and potentially Rocket and War Machine, although the one shot of them together was very obscured) scrapping on it. We still don’t have a clear picture of just where this fight is taking place, but the wreckage is pretty Earth-like (remember, the shot of Ant-Man in this sequence had pens and measuring tapes in the wreckage), adding to the confusion. 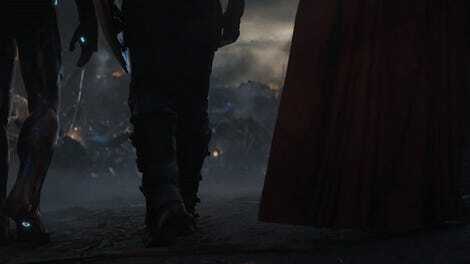 Finally, we end on a spine-tingling hero shot from the same ruined battlefield—three of the original Avengers, the three that really started it all those many years ago, taking a slow, determined walk toward Thanos, sitting slumped next to the gigantic double-bladed sword we saw in yesterday’s overload of toys. So there you have it—everyone’s sad, except for Carol and Thanos, basically. But while this new footage is slight on any major new revelations, what it does for us is fill in a lot of the gaps left in our prior looks at the movie, allowing us to shuffle about and re-order a pretty decent timeline of our scattered heroes coming together again. But even then, it raises even more questions than ever before. All this footage seems to come pretty early on in the film, to boot—so while the Avengers are game to take the fight to Thanos once more, it’s also clear that there’s going to be a lot more to come beyond what we’ve seen already. A lot more, given that run time. 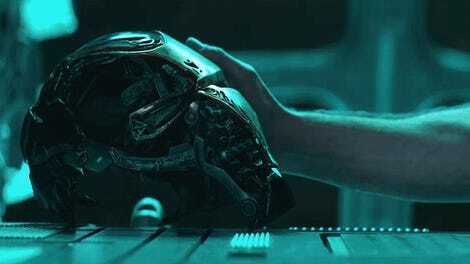 Avengers: Endgame assembles in theaters April 26. You Could Not Live With Your Own Failure. And Where Did That Bring You? Back to Me.